The Konnekt Videophone is a large touchscreen phone that requires only a light touch to activate. 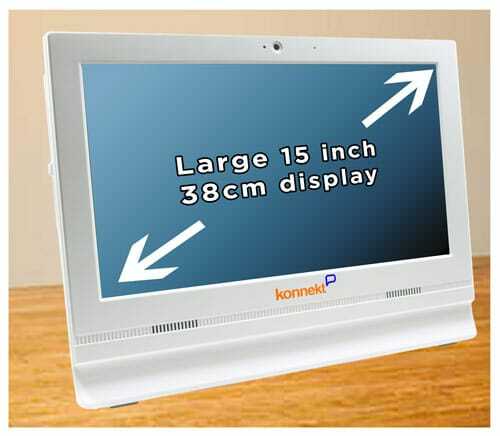 The Konnekt Videophone’s large 38 cm touch-screen is bigger than an iPad or tablet. You can see it easily from anywhere in the room, from the comfort of your favourite chair. It brings your friends and family to life, just like the faces on a big TV, letting you SEE how they are feeling. The touchscreens of practically every mobile phone, tablet and computer are capacitive, which means that they can only be used with a naked finger. They sometimes trigger falsely while your finger is still hovering above the screen. In contrast, the Konnekt Videophone’s touchscreen is resistive. It will not trigger falsely until you actually touch and lightly press the intended button. You can use a glove, a bandaged hand, a prosthetic, a telescopic wand, any type of pointing device… in fact, anything at all. It’s ideal for those who cannot use skin contact and those with unsteady hands. The Konnekt large touchscreen phone lets you see your contact’s whole face and facial expression. If they sit back a little, it also receives their gestures and body language, and picks up any other friends or family in their room – so you can share a smile, as if you were together and only a metre apart. How does it help those with a disability, impairment, chronic illness, restricted movement, and the paraplegic and quadriplegic? The Konnekt Videophone has a LARGE one-touch screen with HUGE buttons. You can use a gloved/bandaged hand, a prosthetic or any pointer. There’s no handset to hold. It supports backup numbers, extended ringing and auto-answer. See Disability applications, or see the Konnekt Disability Videophone designed specifically for those with an impairment.